The sound of screeching Green Parakeets woke me up, confusing me temporarily as to where I was. Had I been magically transported to Australia? Had it all been a dream? Green parakeets are exceedingly noisy! Unfortunately I hadn’t been magically transported to the Southern Hemisphere overnight, and was still in Ramsgate, however there are a lot worse places to be in world and the sun was still shining. I’ll just have to pedal to antipodean climes at some point. I was a little late up so was in a bit of a rush to get ready, quickly stuffing down breakfast, and grabbing a shower before packing up. I bid goodbye to my neighbours, wishing them luck with their move, and was on the road by about 10.15. 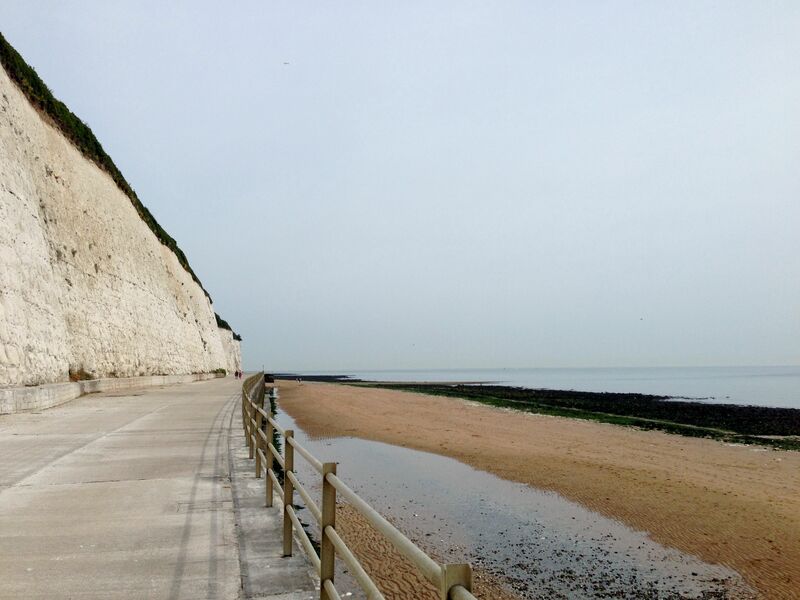 First up I cycled to Ramsgate seafront to join up with the ‘Viking Coastal Trail’, a cycle/walking path that would take me around to Margate and hopefully beyond, avoiding having to use any roads. 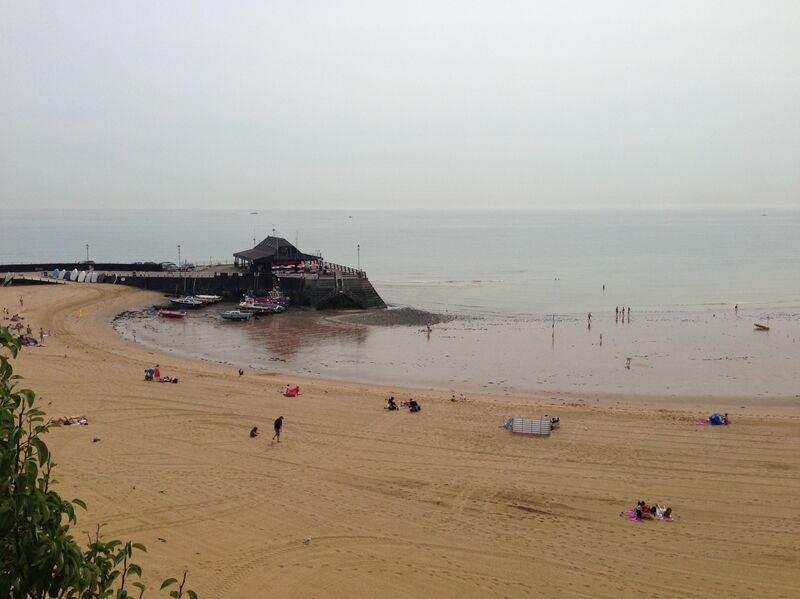 After doubling back I had a good ride around to Broadstairs, which was packed with tourists and foreign students. The beach looked nice; judging from the tyre tracks and patterns in the sand I think they must rake it very day. 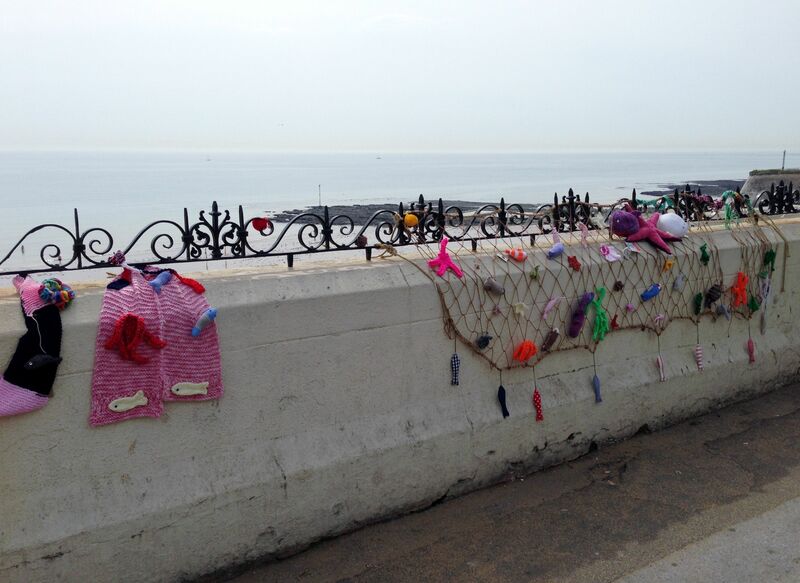 Above the beach someone, or perhaps a group of daredevils, had hung knitting along the railings. I think this must have been the scene of a ‘knitting bomb’ escapade. Knitting bombing is a form of graffiti or street art, where artists secretly decorate areas with colourful displays of knitting and extreme crocheting. Pretty cool, and in keeping with a seaside theme in this case. The Viking Trail is fairly wriggly, and I wove my way around the coast adding on several more miles than if I’d taken a more direct route via the road. It was much more pleasant riding along the trail without any cars to worry about, although I did have to make good use of my bell to alert walkers, mobility scooters, and other cyclists as to my passing. 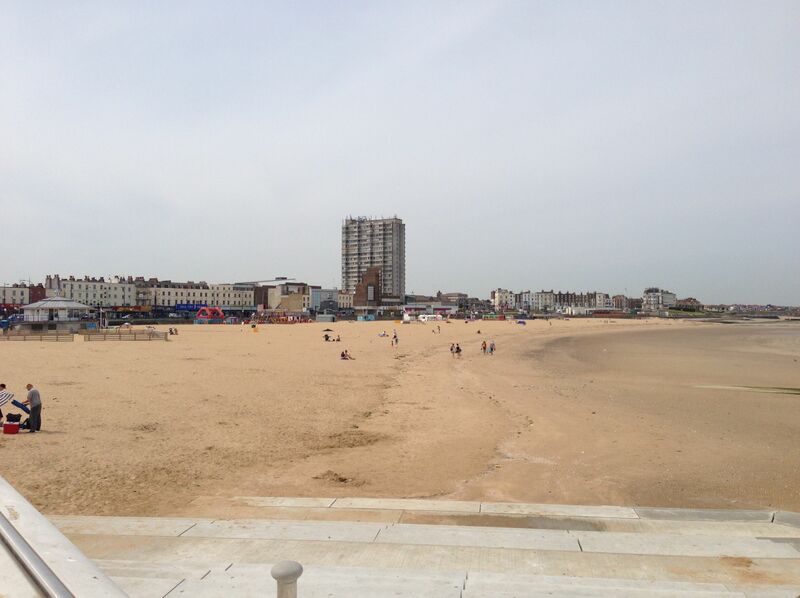 I made it to Margate, which had the usual seaside town amusements and rides, and didn’t look as nice as Ramsgate. It was still thronged with people on their holidays, enjoying the beach or just walking along the promenade in the sunshine. It was getting pretty hot by this point. Handily the Viking Coastal Trail runs all the way along to Reculver so I didn’t have to use the busy A299 at all, and could stick nice and close to the coast past Minnis Bay. 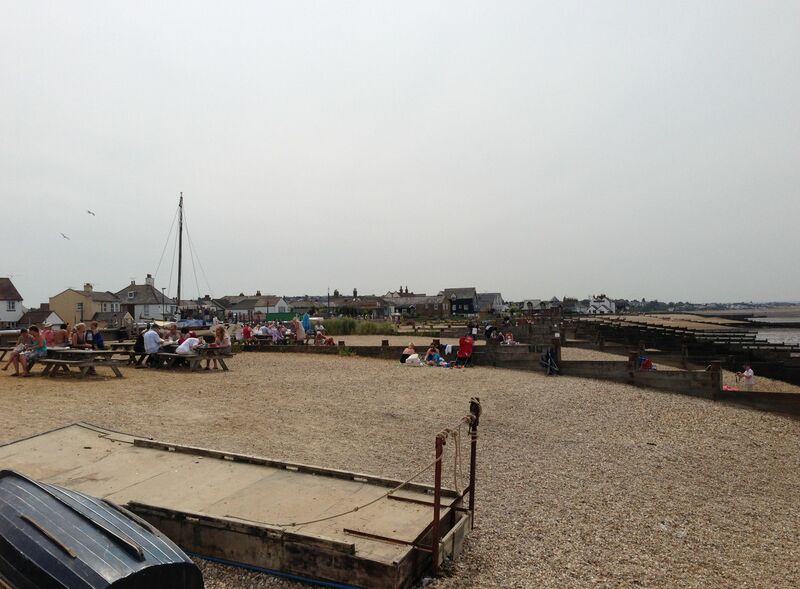 There are a few sections you have to get off and push your bike through, mainly areas where there are a lot of beach huts and hence lots of people, but for the most part it was lovely smooth and relaxing riding. I did go wrong a couple of times due to enjoying it too much and not concentrating, not noticing the sign that directed me up onto a different section and ending up at a dead end. My excuse was the signs really aren’t that obvious, but basically it was a case of user error. I was somewhat exonerated when I met up with another cycle tourer who’d made exactly the same mistake as I, and was pedalling back to join the correct route. He was over from the States doing a tour around this part of the coast and we rode together for a while, before I pushed on towards Whistable. I rode through Reculver passing the Reculver Towers, site of a Roman fortification and subsequent buildings of a similar nature. I wasn’t really in a historical sort of mood today, so didn’t stop to examine them in any detail. I was happy enjoying the sunshine and mulling over ideas for the future. The plan to cycle to the Arctic Circle was gradually gaining favour as the next ‘big one’, however I was also keen on the Mediterranean; I’ll probably end up doing something completely different anyway. I was also thinking about my idea for starting a cafe/bar type establishment similar to Sundowners down in Polzeath, run by Matt, however I was having difficulty settling on a name and theme. There are just too may things I want such a place to offer/be; currently ‘The Adventurer’s Retreat’ is my favourite, offering meals with variable portion sizes depending on calories required, and sourcing food from supermarkets that they’re about to throw away, adventuring advice (guest speakers etc), maybe a small book section, live music/open mic nights, maybe a workshop, cool decor, a mini climbing wall, and of course beer…and a bunk room…and a fireman’s pole…okay the last one is just something I’ve always wanted in my house. 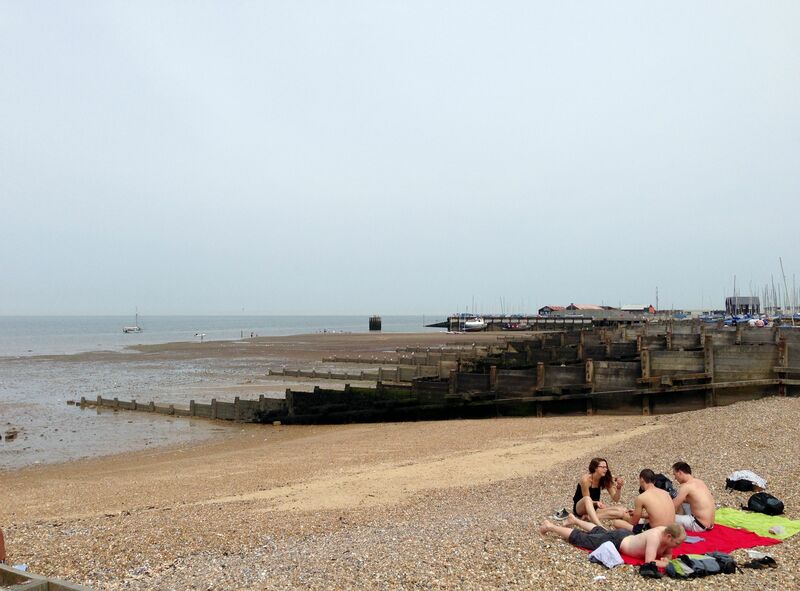 I joined the Oyster Trail (route 15 I think) which took me to Herne Bay, then round to Whistable where I stopped for lunch. 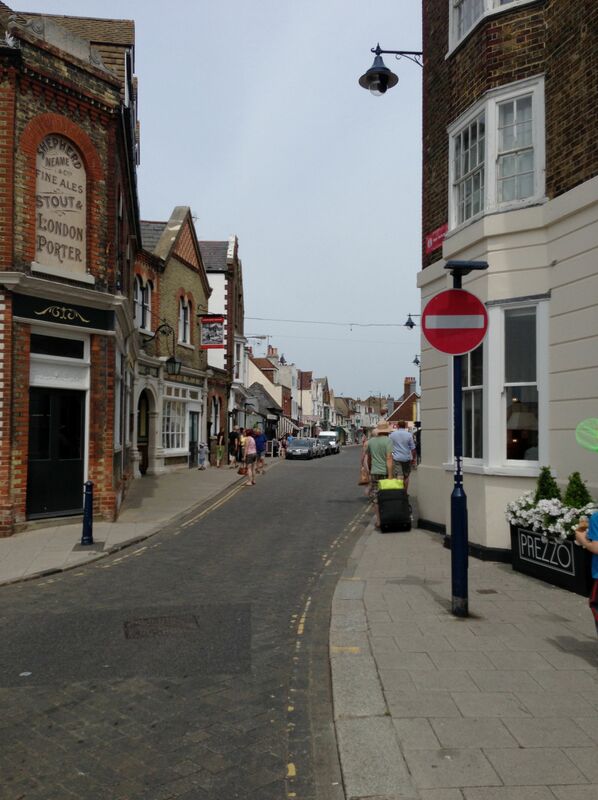 Whistable is a nice town with pretty buildings and shops, and an interesting waterfront. A friend from work, Tim, had recommended the Salt House restaurant for a meal, but unfortunately I don’t think it opened until the evening, if indeed I found the right place. I settled on some sandwiches from Co-op which I ate on the beach; you can get some good deals if the sandwiches are nearly out of date. After a pleasant stop I rode on through Seasalter joining up with my old ‘friend’ Route 1, which I was worried might happen. I thought Route 1 might have mended its ways since our last encounter, and decided to take it for a bit as it seemed to be following the coastline…error. I unknowingly passed a signpost covered in foliage, and ended up off course and deep in farmland after following a track that looked as if it should be cycle path, but really wasn’t; a lot of Route 1 cycle paths I’d experienced previously had been pretty bumpy and rutted. I was on the wrong side of the river, with the way forward blocked by locked gates, so I had no choice to but turn around and pedal about a mile and a half back looking for the correct route. I found the turning I’d missed, which was easier to spot from this direction, and stopped to remove the foliage that was obscuring the sign so that other tourers stood a better chance of seeing it. The path took me in the direction of Faversham, where I should have been about 30 minutes ago, so I picked up the pace to try and make up some time. Route 1 was not however done with me yet, and I encountered my next obstacle after about 15 minutes of riding; a narrow footbridge entirely unsuitable for bikes, let alone touring bikes loaded the nines with panniers, tents etc. I could only laugh. There was no way my fully loaded bike could squeeze across the bridge, it was too narrow, so I took all the panniers off and carried everything, including the Ridgeback, over to the other side. Whilst I was loading everything back onto my bike, getting slightly nervous about the dogs barking in the boat/scrap yard I was about to ride through, I decided to join the road at the next earliest opportunity. It would be busier but would stand me a chance of making it to Gravesend this century, and I’d also had enough of Route 1 and its antics again. 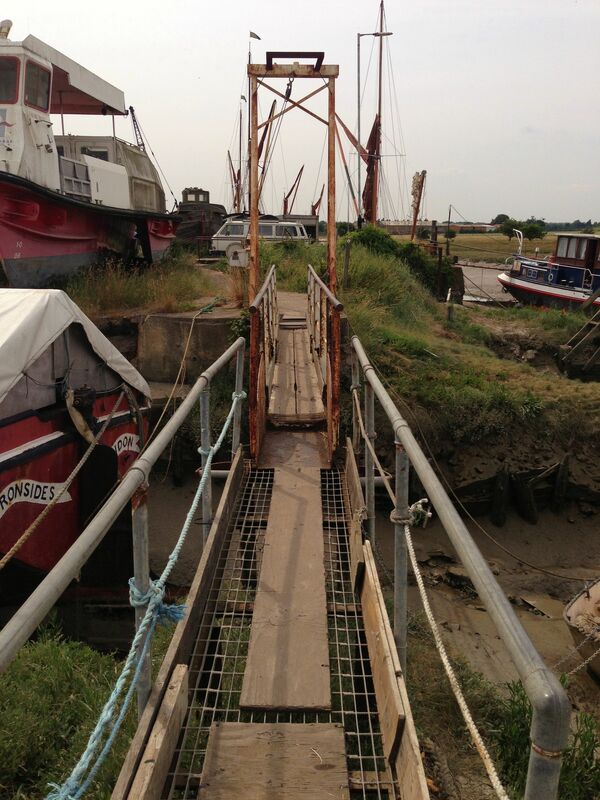 I later learned I wasn’t the only person to have trouble with this bridge and their bike; Anna Hughes (@EatSleepCycle) who has also cycled around the coast of Britain, shared a very similar picture to the above via Twitter, from her ride a few years ago. I made it through the boat yard without getting savaged by any dogs, and joined the busy A2 making good progress once past Faversham. It was busy, smelly, and pretty hazardous due to the number of lorries and some erratic driving on the part of impatient car drivers, but it went in a mostly straight line and had the occasional bit of cycle path I could take advantage of. I arrived in Sittingbourne, where I stopped for a cold drink, before continuing on to and through Gillingham, Chatham and Rochester, all of which were very busy and not pleasant to cycle in. 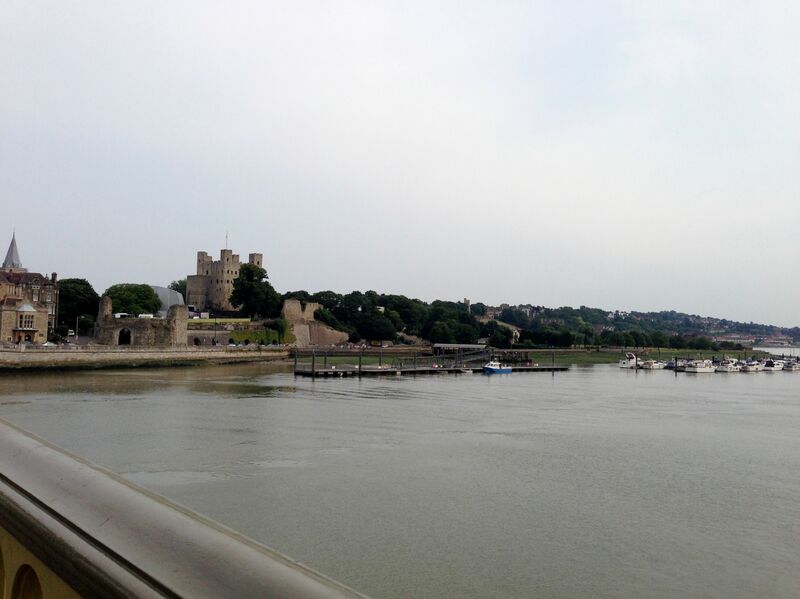 In Rochester I crossed the River Medway, and was afforded a good view of the castle from the bridge. I took a wrong turning again near Rochester, I really wasn’t concentrating very well today, and ended up continuing on the A2 towards London. The road fortunately had a cycle path next to it, otherwise I’d have ended up in the traffic joining it from the M2 with car drivers still very much in motorway mode. 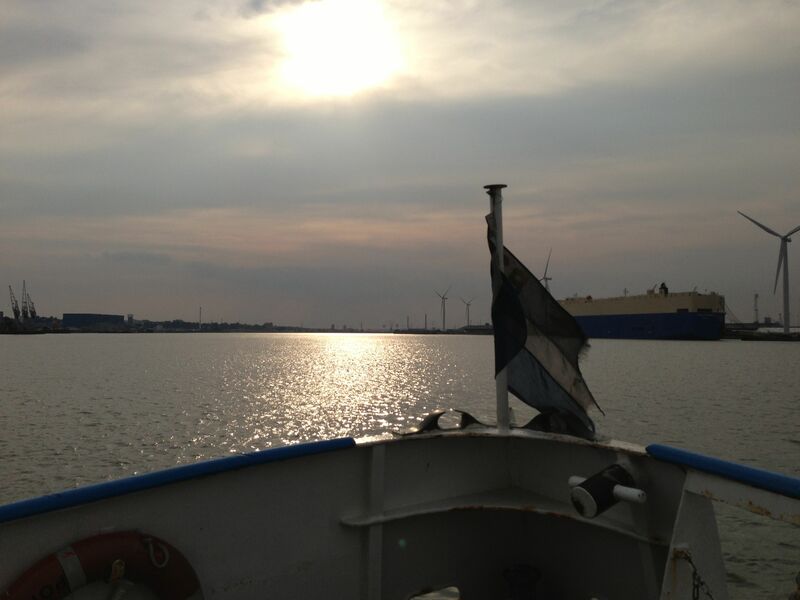 I was able to cut back through country roads via Thong and Shorne to the A226, and pedalled on to Gravesend where a friendly couple of street attendants directed me towards the ferry. Feeling a bit low on energy I bought some milk and Fanta to refuel; it was another sweltering day. I found the ferry after having to wheel my bike down the pier and practically through a restaurant, and chatted to another cyclist out for an evening ride whilst waiting for the boat. She was training for Lejog in a couple of weeks time, and was fairly nervous about it despite the ride being supported and staying in B&B’s along the way. I gave her a couple of tips, such as not leaving home without any spare inner tubes. a spoke tool, or Chamois Cream; the latter has been a blessing in the hot weather to prevent chafing. The ferry across the Thames cost £3, and it was easy to wheel bikes on and off. 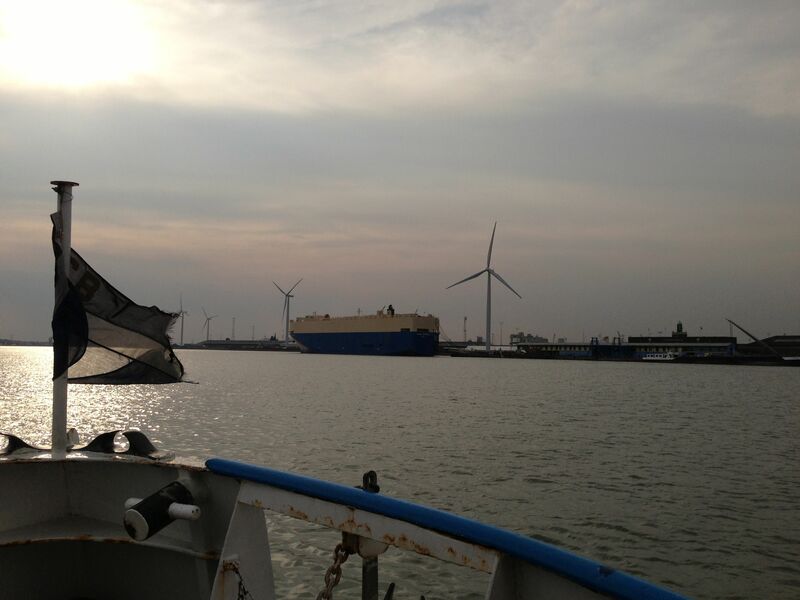 It didn’t take long to get across to Tilbury where the boat docked about 18.30. 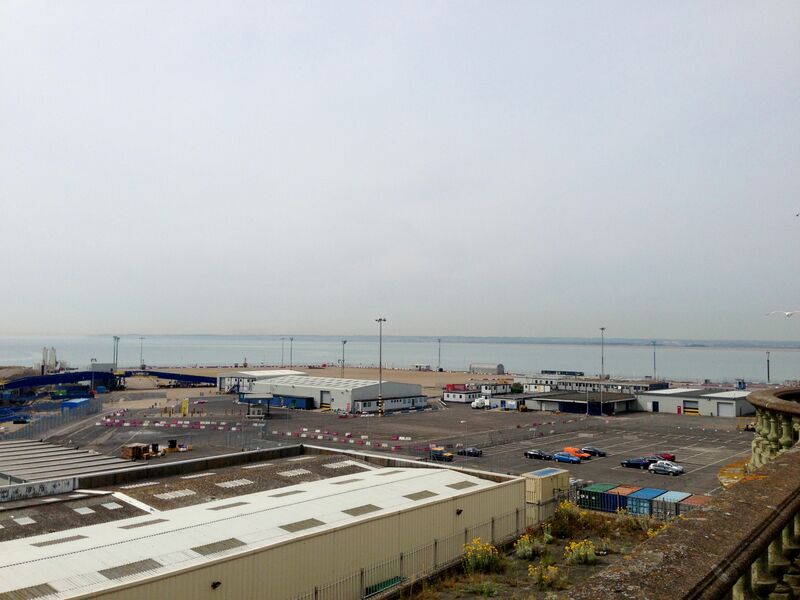 It felt like another milestone to make it across the Thames, and effectively be back in East Anglia, or close to it. My destination for the evening was Rayleigh, and I set off through the mostly flat Essex countryside, being passed by the occasional roaring, lowered, under-lighted, tinted window fiesta driven by Essex boys and girls doing the evening rounds. On the whole the roads were a lot quieter than south of the Thames, and I made good progress engaging my ‘mile eater’ mode. I bumped into a few other cyclists out for an evening ride at a railway crossing in Stanford le-Hope, and had a bit of a chat whilst waiting for the barriers to open. There are some really friendly people you meet whilst on the road. Avoiding the A13 by sticking to B-roads I pedalled over a few hills south of Basildon, not somewhere I wanted to get embroiled in. I ignored Canvey Island which didn’t seem to have a campsite, although I dare say I could have found a quiet spot to wild camp. It was an island anyway so under my own rules I was allowed to skip it; I’d included plenty of other far more exciting islands. I stopped at a Cooperative to buy a few supplies and stood in their cold isle for a bit to cool down; it was lovely although I must have looked pretty manky by this stage, and was slightly worried the Essex fashion police might apprehend me – my tan just wasn’t fake enough. It was a short stretch to Rayleigh and the campsite I’d picked out earlier, although I did have to tackle an unexpected 14% climb, which was well timed seeing as I’d just bought supplies which were hanging off my handlebars, reducing my stability somewhat. It was pleasant cycling through quiet countryside to Wyburns Farm campsite, after negotiating a final obstacle of a dual carriageway which I had to push my bike over; I thought there’d be a bridge over it, or a tunnel under it, but there wasn’t and I had to make a dash for it when a gap appeared in the traffic. It was 20.30 by the time I arrived, and after checking in I set up quickly amongst lots of annoying biting insects. It was only £8 a night, but was a very basic campsite with no shower. Instead I took advantage of a hosepipe to wash away the day’s sweat and grime, which was lovely and cool after such a hot ride. I quickly retreated to my tent to get away from the flies, and ate ham sandwiches washed down with strawberry milk. I’d covered around 92 miles today, maybe a few more due to unexpected detours, and was feeling pretty tired. The leg tomorrow should be a lot shorter, up to Colchester, and I was considering booking a hotel for a treat prior to Latitude. 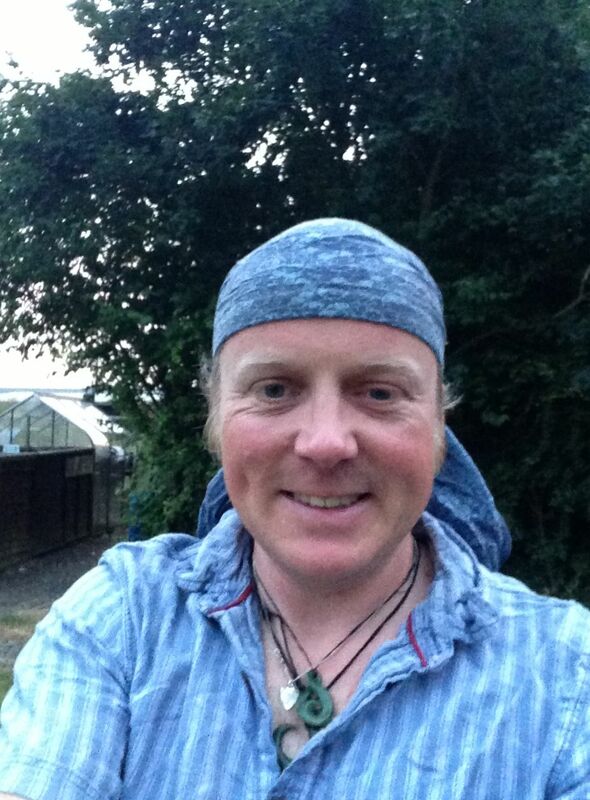 I was getting pretty excited about the festival now, and joining the Tour de Latitude the day after tomorrow. This entry was posted in Bike around Britain 2013 and tagged adventure, bicycle, bike, Bike around Britain, charity, countryside, cycle, cycle touring, cycling, expedition, fundraising, Gravesend Ferry, outdoors, sunshine, Viking Coastal Trail on October 22, 2013 by SelfPropelled.